Are cell phones dangerous to use at the gas station? 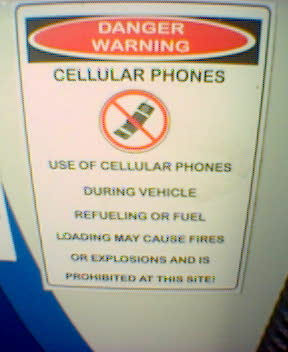 All over the world there are signs similar to this, is there the slightest bit of support for the danger of using a cell phone at the gas station? Related to: Are personal electronics a risk to commercial aviation? Snopes does a much better job of explaining this than I would. Basic summary. Not only has there not been a single confirmable incident reported worldwide that can be attributed to cell phones, no one has been able to reproduce it in a lab. If you take apart your phone and make an ignition switch out of it. and if the station you go to has poor vapor controls, you might succeed in igniting fumes from the pump. Otherwise the only thing that's likely to even generate enough spark/heat to ignite fumes is if your phone's lithium battery ignites. There are a couple of documented cases of that, so if you're buying cheap batteries in china then in an exact perfect scenario at the pump, it could happen. It is theoretically possible to set off a petrol fire with a phone. The amount of energy needed for a spark to ignite petrol vapour is 0.2 mJ, which is roughly one five-millionth of the energy stored in a fully-charged phone battery. The difficulty is that the phone is not designed to make sparks. However, it seems that the phone is not what we should worry about. And why worry about the phone battery when you have batteries in your iPod, CD player, mini-torch, and yes, don't forget the big 15 kg car battery that powers the electrics of your car? ... And consider that in the UK , some 200 Shell petrol stations have mobile phone towers in the tall petrol price indicators, which stand right there on the forecourt, a few metres from the petrol pumps... So what did set off those 243 petrol station fires? Most of the time, static electricity was the culprit. Not the answer you're looking for? Browse other questions tagged mobile-phones . Are personal electronics a risk to commercial aviation? Are decorative magnets on refrigerator dangerous? Are mobile phones causing the demise of bees? Is it bad to turn on a cell phone and electronic devices during a commercial flight? Have cell phones ever been used as microphones by a government? Are train passengers exposed to dangerous levels of cell phone electromagnetic radiation? Are there mobile phones in North Korea? Are the location of brain-tumours linked to which ear you use a cell-phone with? Can cell phones be remotely converted into listening devices? Do cell phones relay their locations to emergency services? Are cell phones harmful to male fertility if kept in trousers pocket? Do elevators increase radiation from cell phone use?